Thailand’s capital Bangkok – the ‘City of Angels’ – ranks as one of the world’s top tourist destinations. Few international cities like Bangkok seamlessly balance east meets west and tradition and modernity. Built alongside the Chao Phraya River, today, enjoy all that one of the world’s favourite cities is popular for: shopping, vibrant street life, nightspots and Thailand’s omnipresent Buddhist culture. Bangkok also ranks as one of the world’s best food cities and Asian food capital. As Thailand’s main culinary epicentre, Bangkok provides a breathtaking plethora of culinary options and is the best place to sample Thai street food. Our visit to Wat Pho coincides with the Buddhist monks’ morning chanting ritual. One of Bangkok’s oldest temples, Wat Pho houses a sacred 45m (148ft) reclining Buddha. Continue to the magnificent Grand Palace, its vast 94ha (233ac) complex containing more than 100 buildings, including Wat Phra Kaew, home to Thailand’s most revered Emerald Buddha. Take a local ferry boat along the Chao Phraya River – the historical “River of Kings” – to Wat Arun. Once a grand royal temple, Wat Arun is iconic for its 82m (269ft)-high Khmer-style tower. Board a restored rice barge for a private river cruise, joined by an esteemed Thai Historian. He shares his extensive knowledge of the Siam Kingdom as we enjoy a sumptuous Thai dinner and Bangkok’s illuminated landmarks. 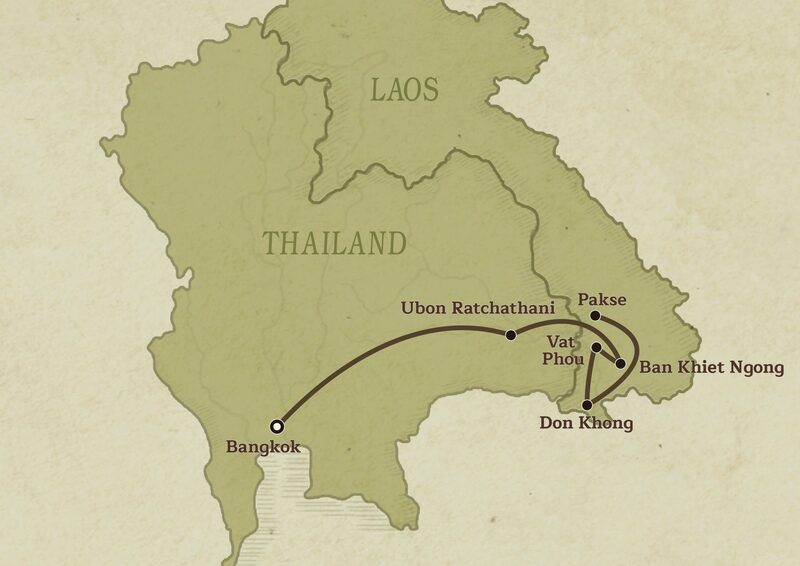 We arrive in Thailand’s northeastern region – also known as Isan – and Ubon Ratchathani, founded in the late 18th century. Today, get acquainted with the history and culture of this so-called “Royal Lotus City”. To get a better perspective, start with a visit to the National Museum. Continue to several important city temples, including Wat Thung Sri Muang, Wat Su Pat and Wat Nong Pa Pong. Visit the century-plus-old Pa-Ao Village, renowned for its brass ware and fine silk weaving. Later, take an evening stroll in peaceful Wat Phratat Nongbua, another significant city temple, before exploring Donklang Market, ideal for sampling authentic Isan street food. Continue to Thung Sri Muang Park, frequented in the evening by locals and dine at a street food bazaar. We make the overland border crossing into southern Laos, arriving at Kingfisher Ecolodge in Ban Kiet Ngong Village. 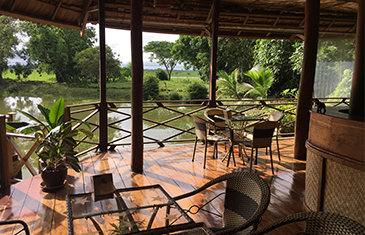 This rustic-style ecolodge edges Beung Kiat Ngong Wetlands, an idyllic conservation area of lowland forests and watery lands, backed by the Bolaven Plateau. These wetlands are part of Xe Pian National Protected Area, one of Laos’ most bio-diverse rich areas and an unparalleled sight in Laos. Spend a half-day hiking around Mount Phou Asa, along rainforest trails that reveal archaeological ruins and endangered wildlife. En-route, our local guide teaches us about the forests’ medicinal plants and flora growing wild here, besides pointing out signs of resident wildlife. Hike up Phou Asa hill, discovering early 19th century monastery ruins and stunning vistas over southern Laos. In the morning, head out on mountain bikes for a cycling tour through several peaceful villages surrounding the Kingfisher Ecolodge. Continue to quaint Lao Gna Village, then hike to one of several waterfalls that edge the 1100-sq-km (424sq-mi) Dong Hua Sao National Park. 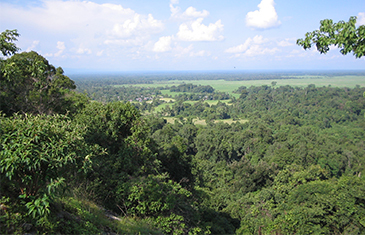 One of the main 20 National Protected Areas within Laos, Dong Hua Sao is home to vast tracts of pristine jungle and important wildlife species. A combination of steep mountainous terrain and lowlands, plus stunning waterfalls are a trademark of this protected area. Take a refreshing dip in crystal clear pools fed by mountain springs originating in the Bolaven Plateau. After a picnic lunch, hike back to the village, then continue on bicycle to the Ecolodge. From riverside Pakse, take a traditional longtail boat, transferring over to our cruise boat, the Vat Phou, a luxury converted rice barge. Embark on a leisurely two-hour cruise to Champassak along the Mekong River. Today’s highlight is Vat Phou, the majestic pre-Angkorian 10th century temple complex at the base of Mount Phou Khao. Considered the birthplace of Khmer Hindu architecture Vat Phou is now a UNESCO World Heritage Site (besides our cruise boat’s namesake). Explore these mythical Khmer temple ruins and tumbledown structures, then visit the on-site museum. As dusk falls, back onboard the cruise boat, enjoy a stunning tropical sunset and dock overnight alongside a remote Laotian village. Set sail for Tomo, a small village close to Oum Muong Temple (Wat Tomo). Built in the 13th or 14th century, this forest-engulfed temple emanates a mysterious charm. We rejoin the Vat Phou boat, cruising in a southerly direction towards Si Phan Don, or ‘The 4,000 Islands’: a mass of multi-sized islands within a 14km (8.5mi)-wide, meandering section of the Mekong River. Late afternoon, disembark to hike through Ban Deua Tia Village, where a traditional way of life has not changed in centuries. 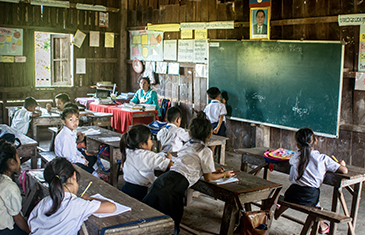 Visit the local school to engage with village students. The day’s fascinating journey finishes at the northernmost tip of Don Khong, the largest inhabited island in this magical riverine archipelago. Enjoy a leisurely breakfast as the Vat Phou cruises the Mekong River to the small village of Ban Veuthong. Board a small boat to meander amid the Si Phan Don archipelago to Don Khone, a peaceful rural island where locals live out a simple life. Once a minor 19th century French Indochina settlement, Don Khone boasts several colonial-era buildings including an old French railway station. Traverse the bridge that links Khone and Dhet Islands and enjoy lunch at a riverside restaurant on Khone Island. 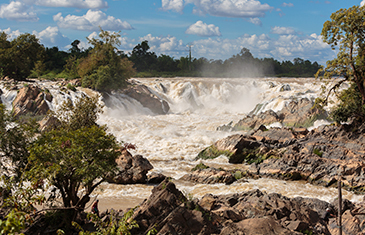 Continue to the thunderous, 10km (6mi)-long Khone Pha Pheng Falls – Southeast Asia’s largest waterfalls, one of the world’s widest and one of Laos’ most magnificent natural attractions. Transfer to Pakse International Airport for your onward flight.